Deciding the IZOD INDYCAR Series field for the inaugural Baltimore Grand Prix, Saturday afternoon time trials on the 2.04-mile street course gave 28 cars the chance to claim supremacy ahead of a 75-lap event on Sunday. Preserving an advantage asserted in the both practice sessions ahead of qualifying, Will Power in the #12 Penske Racing car took pole in the Firestone Fast Six session. Emerging with a 1 minute, 20.2447 second lap to take the top position for the Baltimore Grand Prix, Power's speed around the 12-turn road course was 91.520 miles per hour the performance bests the effort of fellow front row starter Graham Rahal by a little less than 9/100ths of a second. Winning the two of the last three road course events held on the 2011 IZOD INDYCAR circuit, Will Power has mounted a significant rebound in the overall series points. Scoring more points than current points leader Dario Franchitti in three of the past four races, Power accumulated 29 more points than the #10 Target Chip Ganassi Racing driver. The #12 Penske Racing car driver Will Power sits 26 points behind Franchitti intending to use the new temporary street course of Baltimore as another opportunity to close the gap. Driving his #38 Service Central Chip Ganassi Racing car to a the 2nd fastest time during IZOD INDYCAR qualifying for the Baltimore Grand Prix Rahal's 4th time netting a top-5 qualifying result in the 2011 season, this front row start will be the Ohio native's best grid position in the season with his new expansion team. "I had a good run going and my team told me where Will Power was on the tracker and they thought he would jump ahead of us. I let the tires cool off and tried to take a lap to get it back where we wanted it." Graham Rahal commented in a post qualifying interview. Will Power's corporate teammate with Penske Racing and fellow Australian Ryan Briscoe slotted third in the #6 car providing an important buffer between Power and Franchitti. Dario Franchitti will start 4th on the streets of Baltimore race. The last time the IZOD INDYCAR Series visited a street courses (the Honda Indy Toronto), Franchitti sailed to victory driving his #10 car for Target Chip Ganassi Racing. Cracking the Firestone Fast Six, was the Dale Coyne Racing #19 car driven by French driver Sebastien Bourdais. Signed only for the road courses for the 2011 IZOD INDYCAR Series tour, the past multiple time champion of the Champ Car series has been enjoying some steady improvements with the Acorn-sponsored #19 car. Starting the year with some rough finishes uncharacteristic the drives Bourdais used to capture 31 wins in just 5 seasons of Champ Car racing. Fortunes for the Frenchman changed with a 6th in the Toronto street race for Bourdais and the Dale Coyne Racing team. Currently, the pairing have finished top-10 in the past 4 IZOD INDYCAR road course races. Completing the Firestone Fast Six was Andretti Autosport's Ryan Hunter-Reay. The leader at Baltimore in qualifying, the driver who continues to receive the most attention in the Andretti Autosport is Danica Patrick. Moving full-time to NASCAR next season, the street courses like that of Baltimore will be a driving experience the popular driver may or may not miss. Through 7 seasons in INDYCAR racing, Danica Patrick top finish on a temporary street course was 4th in the 2009 Grand Prix of Long Beach. Patrick and the #7 car will start deep in 25th spot for Sunday's Baltimore Grand Prix. The remaining Andretti Autosport drivers starting Sunday's race has Mike Conway 8th on the grid while Marco Andretti will be positioned 23rd. 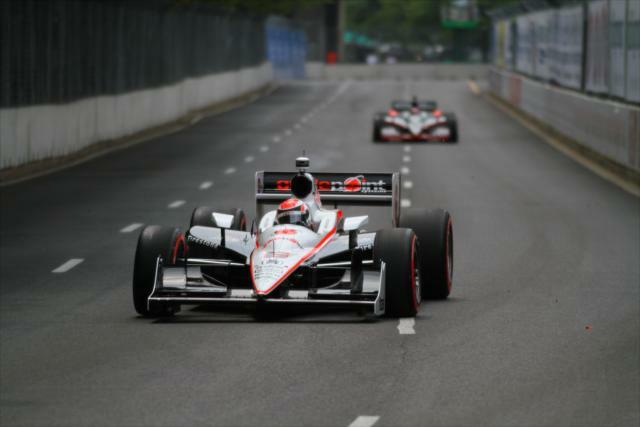 Other notable qualifying efforts in prelude to the first Baltimore Grand Prix includes Scott Dixon starting 10th and Tony Kanaan in 11th place. Back to the IZOD INDYCAR Series after missing the past race at Sonoma due to travel issues, Swiss driver Simona de Silvestro brought the #78 HVM Racing car to a 12th place result in qualifying. Speaking about the incident on the HVM Racing team website, de Silvestro stated, "This whole experience was frustrating, but I really want to thank my fans and sponsors for their support. It was also great to see that my team was able to persevere and post a good result with Simon Pagenaud last weekend. Now it's time to focus on the Baltimore Grand Prix and the rest of the season. We're setting our goals high for a solid finish." Behind de Silvestro's #78 car, the second Dale Coyne Racing entry of James Jakes posted a solid 13th fastest worthy of honourable mention. Racing for 75-laps around the 2.04-mile temporary street course, the 2011 Baltimore Grand Prix race for the IZOD INDYCAR Series will receive its green flag at 2:45PM.